Olivia Jenkins, the daughter of a Greenville High School alumna, will play soccer at Xavier University. CINCINNATI – The daughter of a Greenville High School alumna has committed to play soccer at Xavier University. 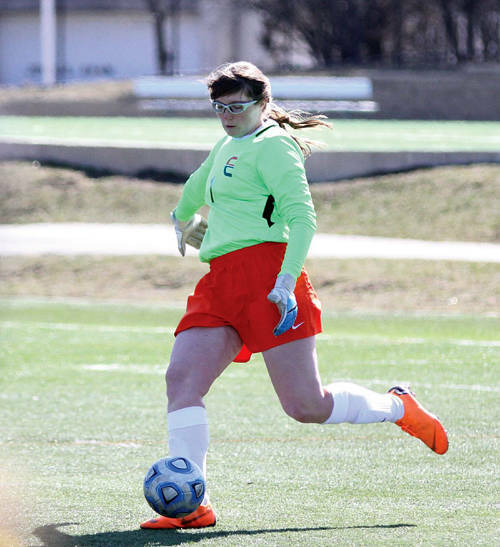 Olivia Jenkins is a goalkeeper from Plainfield, Illinois, who is part of Xavier’s 2018 recruiting class. She is the daughter of Annmarie and Scott Jenkins. Her mother, the former Annmarie Fletcher, is a 1986 graduate of Greenville High School where she played varsity tennis under coach Vanis Brumbaugh. Her father is a 1984 graduate of Northmont High School. He played baseball for Northmont and received a college scholarship to play baseball. Jenkins is the Mr. and Mrs. Tom Fletcher of Greenville and the granddaughter of the late Mr. and Mrs. Ron Jenkins of Union. Jenkins was an honor student all through high school and also played basketball for Plainfield East High School. She scored more than 1,000 career points in basketball, was named to the all-conference team and was the conference player of the year during her senior year. Jenkins plans to major in bio physics at Xavier. This entry was tagged College, College signing, Greenville, Soccer, Xavier, Xavier University. Bookmark the permalink.